Once again, I am reminded that I need to take some photography classes. 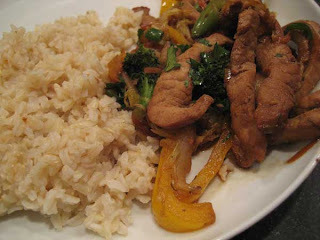 This recipe for Move it Along Pork and Veggie Stir-Fry from Get Real Meals is definitely a quick and healthy keeper. We don't eat a whole lot of red meat (not for any good reason, I just don't like it that much other than in a burger), so I like to mix it up every now and then with a pork dish. That's what I was thinking when I picked out this recipe, plus I love having my meat and veggies all in one dish (less cleanup to do in the end). Combine the pork in a shallow dish with the tamari, ginger, half the lime juice, and honey. Let the pork marinate while you chop up all your vegetables. By the time you are finished, the pork will have marinated long enough. Heat a large nonstick skillet with about 2 tablespoons of the vegetable oil. Remove the pork from the marinade; shake off the excess marinade and reserve. Once the skillet is screaming hot, add the pork slices in one even layer. Cook the sliced pork with out stirring for 2 minutes. Toss the pork with tongs and cook for 1 more minute. Remove the pork from the pan and reserve. Add the remaining tablespoon of vegetable oil to the skillet. Add the white part of the scallions, the garlic, and the bell pepper, Anaheim peppers, shredded carrots, and mushrooms. Cook for 1 minute, stirring frequently. Add the broccoli and the napa cabbage; continue to cook and stir for two minutes. Add the reserved marinade and chicken stock, bring up to a simmer, and cook for 2 minutes. Add the pork back to the skillet and cook for 1 more minute, or until the pork is cooked through. Turn the heat off, add the remaining lime juice and cilantro, and toss to distribute. Taste for seasoning, add more tamari or lime juice accordingly and serve immediately. Sounds great, I think I will try this! I just found your blog and am loving it! RR kind of annoys me at times, but her stuff is FANTASTIC! !